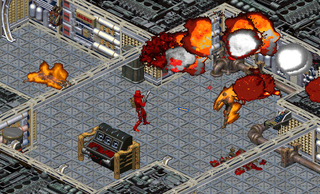 Maybe because it's never got a modern remake, maybe it's because you wore a silly red helmet, but EA's Crusader: No Remorse has never got the love and respect it deserves from a 21st century world. Maybe that'll change now that everybody can play the game for free. First released in 1995, it's an isometric action game where you play a guy in a robot suit who walks around like Robocop, solving puzzles and shooting everybody who gets in your way. It was fun, it was gorgeous (for the time, though its aged very gracefully), and it also featured some of the worst/best acting of the FMV era. If that sounds like something you might want to check out, starting today the game is free on Origin. Even if it doesn't sound like something you'd want to check out, you may as well anyway, just so you can see Weasel with your own eyes.